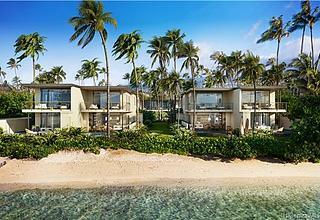 Prime Diamond Head Oceanfront Location boasting approximately 122 linear feet of Sandy Beach Frontage. Enjoy ocean views from virtually every room of this stunning modern luxury residence. Steel & concrete construction with custom details & quality materials throughout. Walls of glass maximize the sweeping PANORAMIC OCEAN, SUNRISE & SUNSET VIEWS. The home’s unique position also captures views of the Diamond Head Lighthouse. Extensively remodeled in 2016, this outstanding home features Smart Home technology, sound system, oceanside Jacuzzi, central A/C, Photovoltaic System, and a generous multi-car garage. Plus an elevator providing easy access to all 3 levels. Former home of famed fashion designer Geoffrey Beene. Conveniently located close to Waikiki - short drive to boutiques, restaurants and nightlife. Courtesy of Patricia Choi, Hawaii Life. I found this listing at 3311 Beach Road in Honolulu and would like more information. Thank you.